When Steve Blank appeared on the cover of Wired magazine 19 years ago, his company then, Rocket Science Games, was expected to revolutionize the videogame industry. At the time, Blank didn't let the skepticism of critics faze him. "I thought I was a genius," he says. Three months later, when he called his mother to let her know he was about to lose $35 million in investor funding, he wasn't feeling quite so genius anymore. "I had lots of choices, including that I could have quit," he says. "Learning from that failure for me was one of the best experiences of my life." And learn he did. In 1996, Blank founded the startup E.piphany, which went on to earn $1 billion for each of its investors. In the past 10 years, says Blank, the culture around entrepreneurship has become increasingly failure-friendly. Serial entrepreneurs in Silicon Valley hop from one failed business to the next and billionaire entrepreneurs like Richard Branson wax on publicly about their failures almost as much as their successes. Still, "no one likes to fail," says Blank. "We are hardwired for success." 1. Call failure something else. When was the last time anyone got hired for a senior-level position without any experience? For serial entrepreneurs, "experience" is simply another word for "failure," says Blank. By labeling a failed effort an opportunity to expand your knowledge base, you're framing it in a more positive light, allowing yourself to add to your credibility as a more seasoned entrepreneur. 2. Use failure as a stepping stone. With every failure, identify what you know you did wrong and be conscious not to repeat your mistakes. This will bring you one step closer to success, says Steve Siebold, a Palm Beach, Fla.-based consultant who works with corporations and entrepreneurs on mental toughness and critical thinking. "I've never heard [a millionaire entrepreneur] say they hit it right the first time out," says Siebold, whose book How Rich People Think (London House Press, 2010) is a culmination of nearly three decades of interviews. "The bigger they are, the more they've typically failed." Entrepreneurs like to be trailblazers. But make a mistake on your own and you might have a hard time determining what went wrong. Having a partner you trust and respect can turn every failure into an opportunity for collaboration. "A good partner can help you determine what not to do again," says Karl Baehr, director of business and entrepreneurial studies at Emerson College, a private four-year college in Boston focused on communication and the arts. 4. Don't hide your failures. Be proud that you were brave enough to take a risk in the first place. By being forthright about your mistakes, you open yourself up to learning from others. Baehr's mentor, Walter Hailey, whose insurance company Lone Star Life Insurance went on to become a Kmart insurance company, used to take an hour-long walk at 5 a.m. every morning with a group of close friends to talk about ideas, successes and failures. "By the time they got back to the house, they had solutions," says Baehr. "They had a plan for the day." 5. Redefine what you want. Revisit and refocus why you got into business in the first place. "Look for your emotional motivators. We are emotional creatures. Logic doesn’t motivate us," says Siebold, who launched five consecutive unsuccessful businesses before he started his current consulting company. For Siebold, that motivator was one day becoming a millionaire, a goal he achieved at age 31. "Most people only half-heartedly decide they want a lot of things. You have to get really clear on what you want," he says. "The question is: How badly do [you] want it?" Correction: An earlier version of this article misstated when Steve Blank was featured on the cover of Wired magazine. This took place 19 years ago. 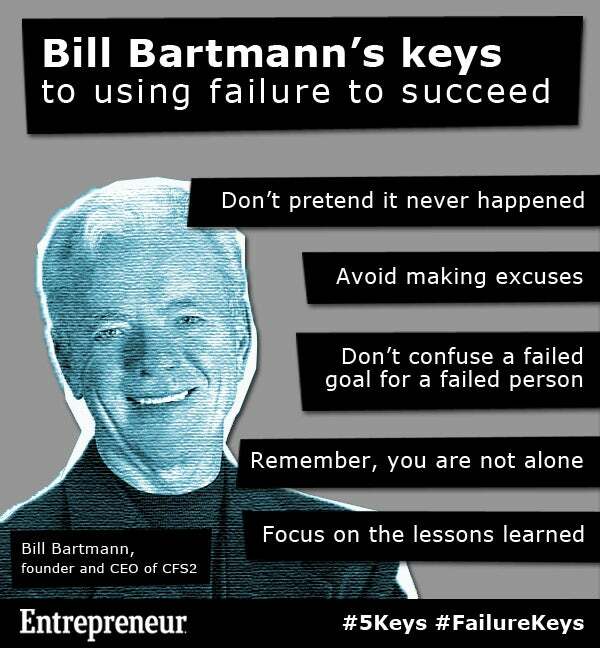 What are your keys to handling failure? Share your thoughts in the comments below. The best submissions will be featured with your name. Jun 29, 2013, Denis Maira Failure is like a rubber ball, the harder you fall the higher you raise. you just got to have the heart for it. Jun 29, 2013, Cindy Romeo Tonnesen Don't focus on the failure. Stay positive and focus on the *goal*. Failure is a bump in the road to success. Look over the horizon and visualize the goal. Use your failure to learn, re-evaluate, and modify the course, if necessary, but the key is to not lose sight of the goal! Many will quit when failure comes, but successful entrepreneurs will learn through the failure and persevere. Jun 18, 2013, Andrew Shumway It's the points in our lives that we are at or near our lowest that make the highest points so incredible. Failures are lows that allow us to learn and adapt and grow in ways we never would have been capable of without them and the successes we see in the future will only be greater because of them. Jun 28, 2013, Jeremy Bartley Failure is what makes the adventure of being an entrepreneur fun and success truly rewarding. Adventure without adversity, struggle and failure would be just another walk in the park. It boils down to a mindset of how you think about failure and what you think the purpose of failure really is. Jun 27, 2013, Tammy Hawk-Bridges As an entrepreneur failure is imminent and necessary. It's just a part of the human condition that we learn best when we fail - pain and disappointment causes us to re-evaluate and search for the better way.